These numbers reflect estimated student expenses for the 2019-2020 school year. Amounts will change slightly from year to year, but as the cost of college increases, the scholarship packages will correspondingly increase. Your official financial aid award will be included in a letter directly from Carleton. Outside funding may be used to reduce a student's self-help aid (i.e. work-study and summer work) first. Funding that exceeds the self-help aid will be used to reduce the Carleton grant. Carleton requires all students to have health insurance. Students are charged for the college health insurance unless they show proof of family coverage. The travel allowance shown above is an estimated average. The actual allowance used will vary depending on distance traveled. Students must remain in good academic standing each academic term. No specific GPA is required to maintain this award other than the minimum to remain in good standing. The requirements for academic progress can be found here. Students must submit the CSS Profile, FAFSA, and relevant tax returns, W-2s, and any appropriate schedules in order to maintain the match scholarship award each year. Figures for books, supplies, travel and personal expenses are estimated and can vary depending on each individual student's circumstances. However, the scholarship package awarded will be based on these estimates. The Student Savings contribution combined with the Summer Work Contribution will be around $2,000. Students may choose to replace their work-study eligibility with a loan. In addition, the student's summer work contribution can be replaced with a loan if necessary. Additional grant assistance, upon request, may be available for music lessons. Carleton College awards financial aid based on need. It does not award academic, athletic, or other merit scholarships, except through the National Merit Program. Carleton is dedicated to meeting the full demonstrated need of each undergraduate for all four years. Carleton's need-based financial aid is awarded on an annual basis. Unless there is a significant change in your family's financial situation, financial aid awards will remain consistent year to year. Carleton meets 100% of demonstrated financial need for all admitted students. 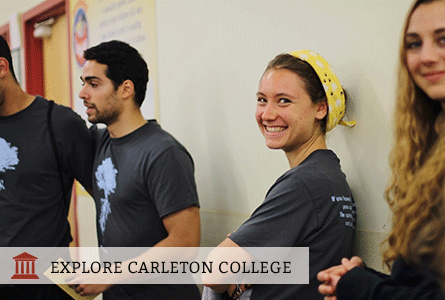 100% of Carleton students with a family income below $75,000 qualify for financial aid. The average financial aid package for QuestBridge Scholars on campus (both matched and non-matched) is nearly $65,000. Around 80% of students have on-campus jobs. Use Carleton's financial aid estimator to get an idea of what you may qualify for.